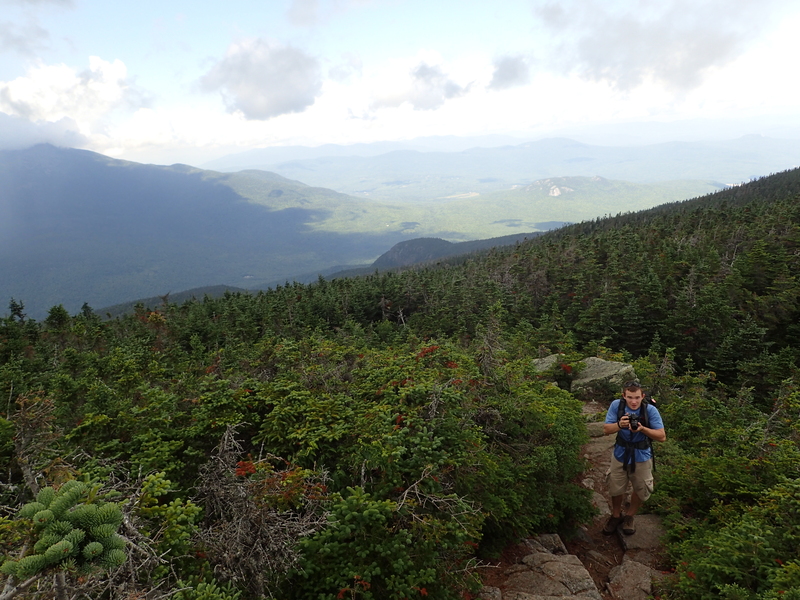 Slowly but surely I am chipping away at my NH 48 peak list but this particular trip actually had two purposes. Not only did I need these peaks for my NH 48 peak list but I also was looking to collect soil samples for my thesis research. Originally I wanted to do my research in the Adirondacks but unfortunately the New York Department of Environmental Conservation denied my permit application. However, lucky for me the US Forest Service was very accommodating and approved my permit application so it all worked out in the end. My cousin Chris and I left NJ late on friday night and didn’t end up arriving in North Conway until about 2am. 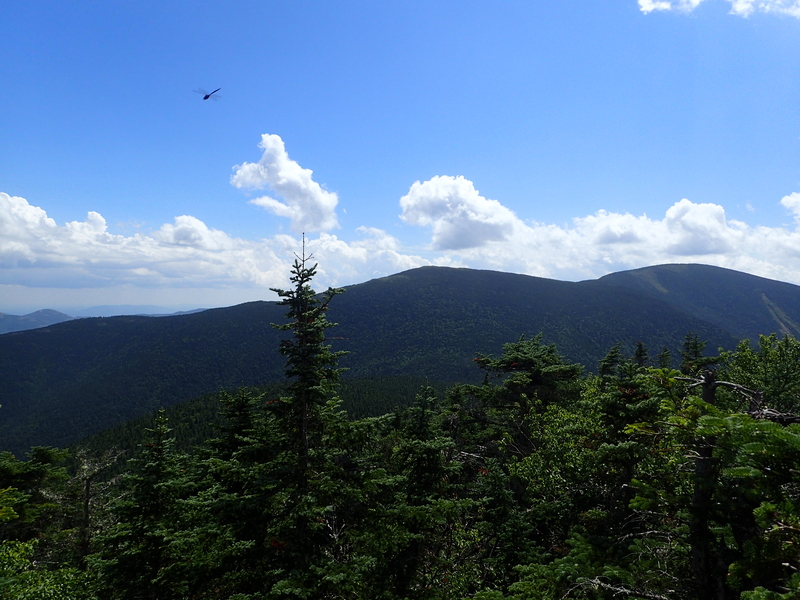 I love hiking in the White Mountains but I have to admit the drive up to NH is a real killer. Despite the long boring drive though there was still some excitement when we pulled up to the hotel which consisted of watching a trio of inebriated bike riders chasing a bear through a parking lot. I like to think this is probably a good ospice on the eve of a hike. Anyway, following those shenanigans we managed to get some sleep and woke up later than intended and after breakfast drove over to the South Imp trailhead where we planned to start our hike. After gathering our things we hit the trail at about 9am. Due to the setup of our particular route we planned to do a point to point hike which included a roughly 2 mile walk on the road to cap off the hike. It was not an optimal setup but the best we could come up with having only one car. Parking spot at the South Imp Trailhead. Start of the hike at the South Imp Trailhead. 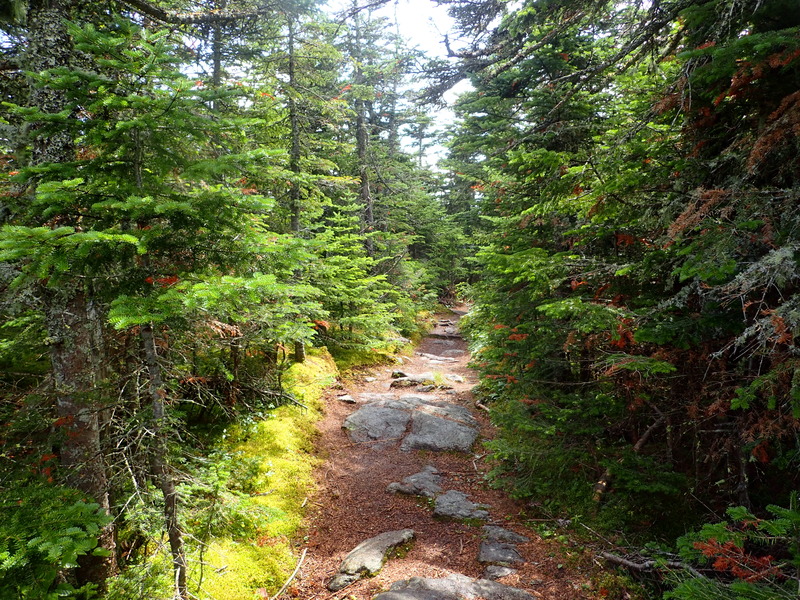 The trail started easily enough along a wide and well traveled trail. One thing I especially like about the Whites is how generally speaking the trails tend to be much less muddy! 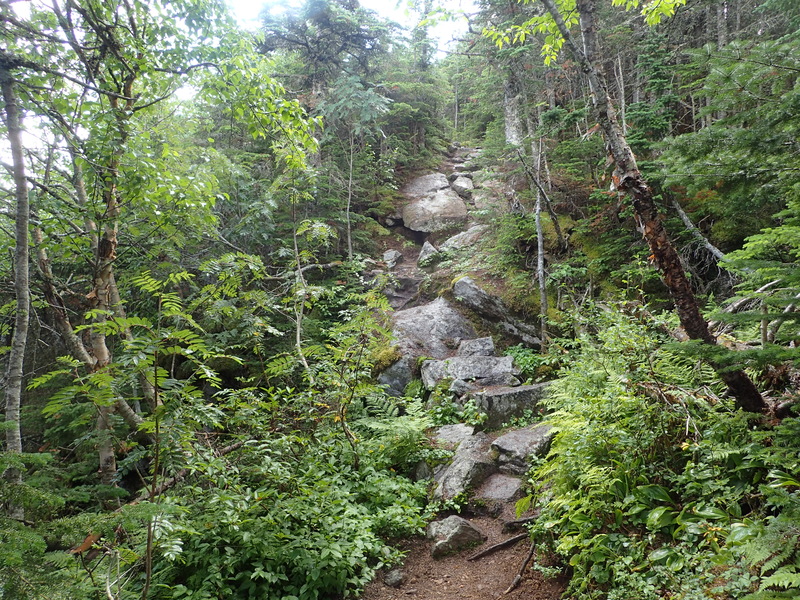 Before too long the trail began to make its steady uphill climb. The grade was pretty constant from start to finish and the oppressive humidity made it a bit unpleasant starting out. The trail got progressively rockier as we gained elevation but it was easy to follow although it was not particularly well marked. Small water crossing along the trail. As we got closer to the first intersection at the top of the South Imp Trail the trail got progressively rockier before making it to the junction with the last section of trail to the top of the ridge. After a quick stop at the junction we continued on our way up towards the Carter Moriah Trail up on the ridge. 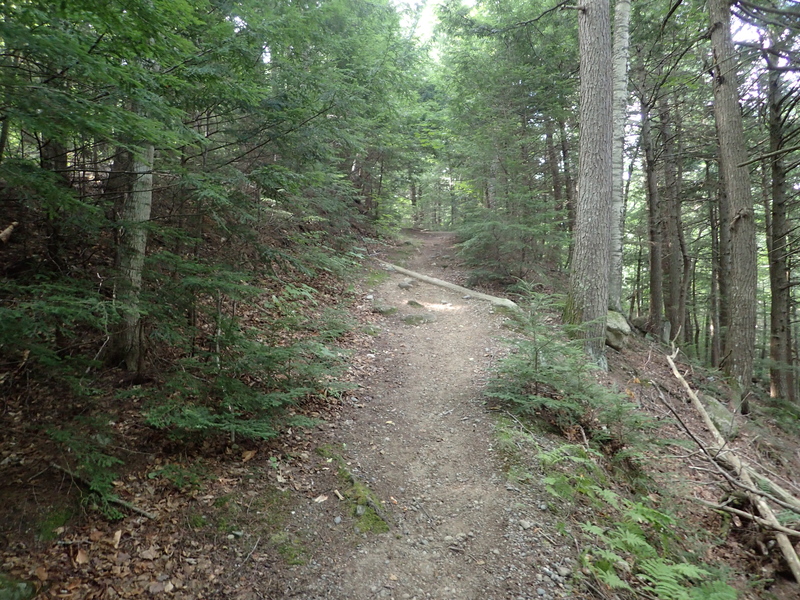 The trail from this point was pretty similar to the South Imp Trail but thankfully it got a bit less steep overall and the humidity and heat tapered off a bit which made the hiking a bit more pleasant. Trail past the first junction. 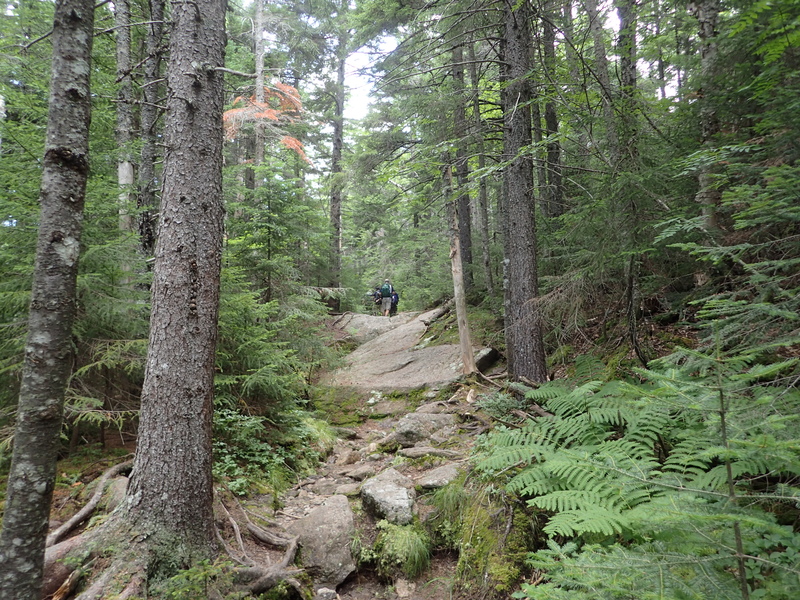 The trail also got a bit narrow in sections as the foliage changed as we gained elevation. 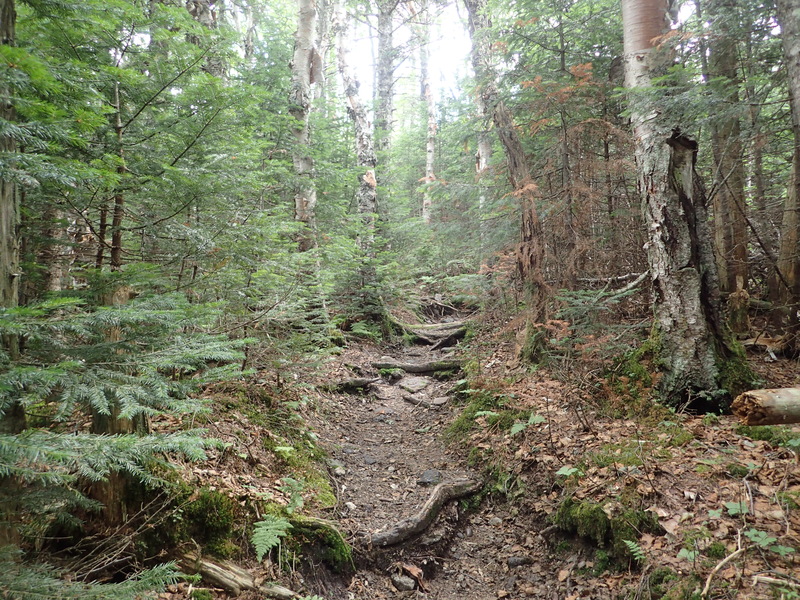 Narrow section of trail as we neared the top of the ridge. 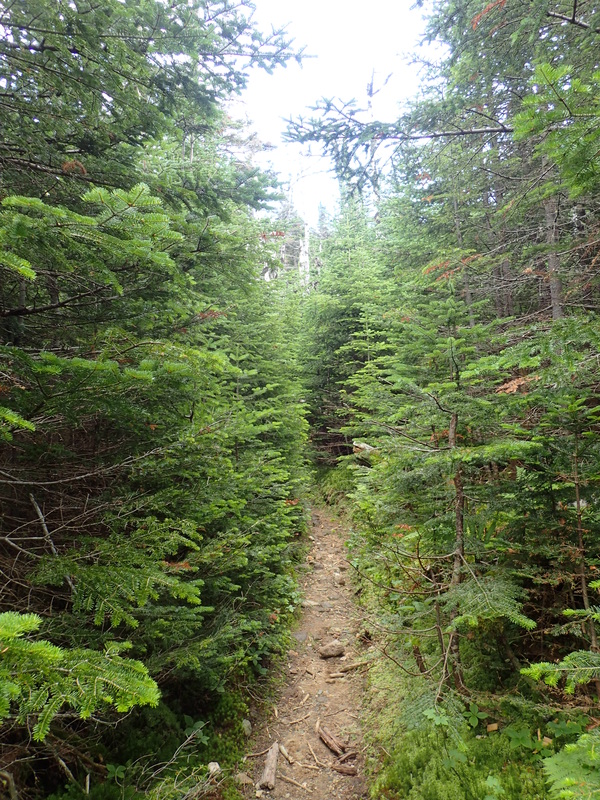 Before actually getting to the top of the ridge the trail also opened up a bit revealing a beautiful coniferous forest. 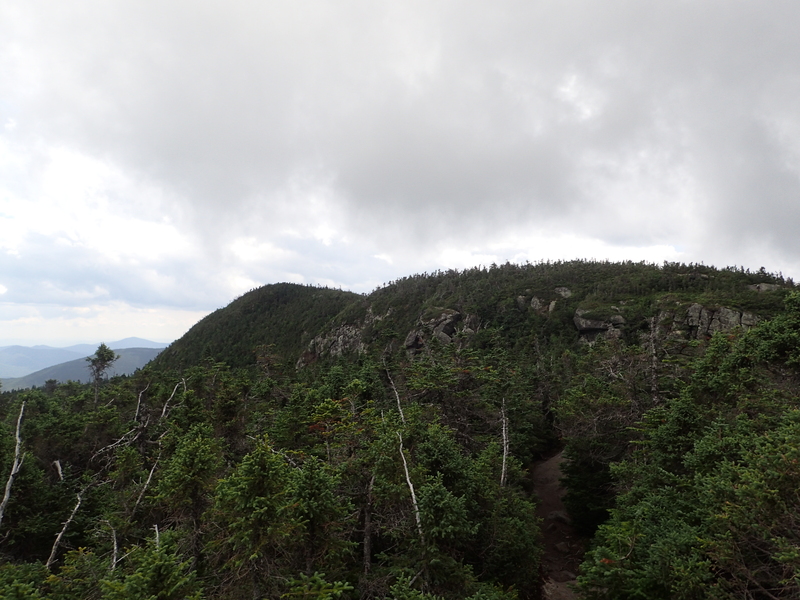 After a bit longer we finally reached the top of the ridge and the junction with the Carter Moriah Trail. At this point the heavy lifting and elevation gain of the hike was complete but we still had about 6 miles left to go. The ridge trail was mostly flat with only minor ups and downs along the way which was a nice change of pace from the beginning of the hike. 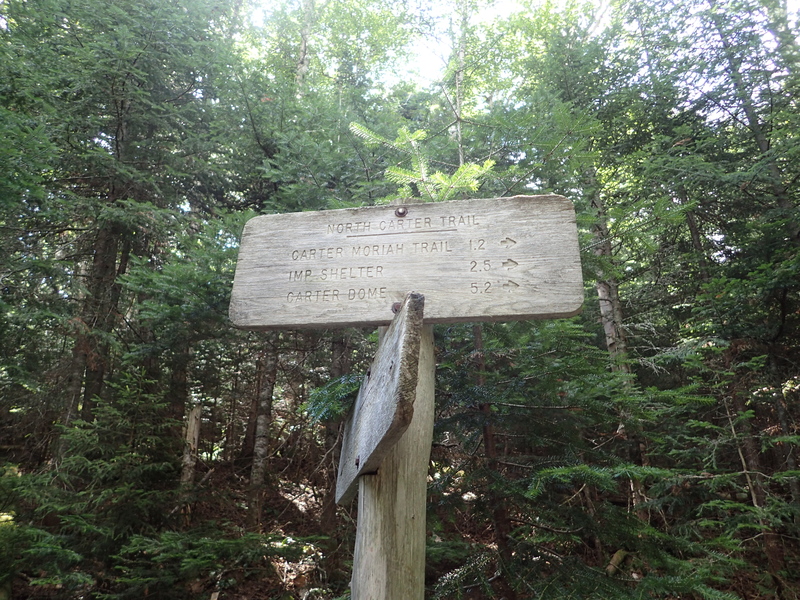 The junction is also the summit of North Carter mountain and although it is well over 4,000 feet in elevation it is too close to Middle Carter and is therefore considered a sub peak and not included on the NH 48 list. Starting down the ridge trail. One of the small scrambles you need to navigate along the ridge. The Carter Moriah trail also sported many boards and walkways which are a nice addition for avoiding most of the mud and preventing heavy erosion from the countless hikers that pass through here. One of the many boarded walkways. 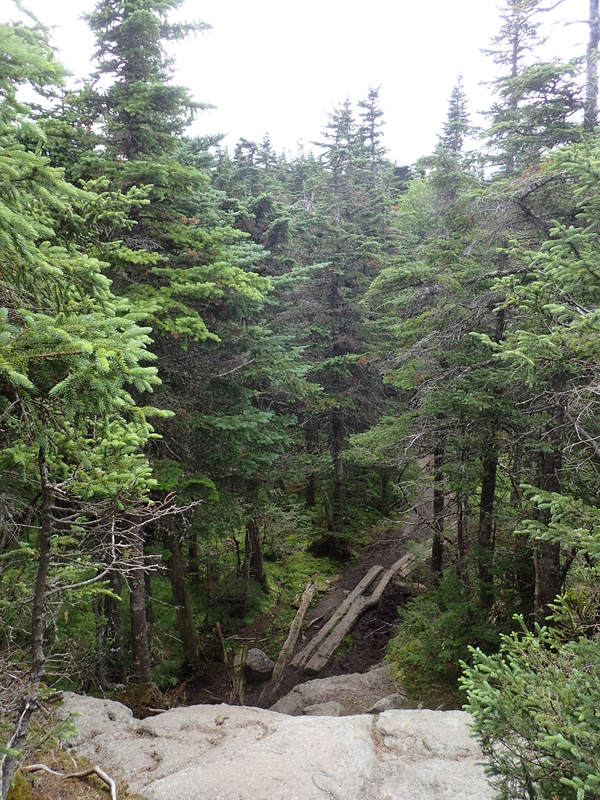 Unlike some of the other ridge trails in the Whites this one is mostly covered in trees which obstruct the great views but in some spots you are able to get a nice view. 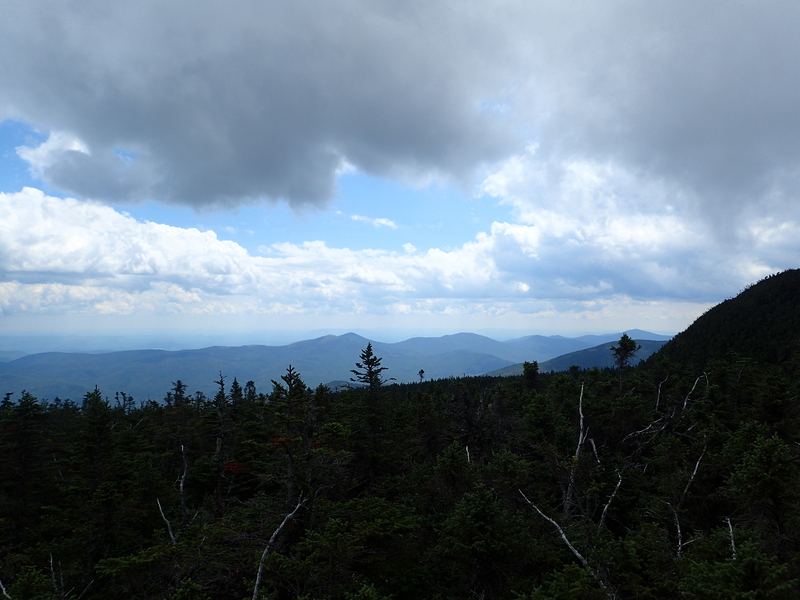 Although we were dealing with clouds that kept rolling in and out obscuring most of the views. Looking back towards North Carter as we approached Middle Carter. One of the brief views we had from up on the ridge. Before too long we finally reached the summit of Middle Carter but at this point it also began to rain so we didn’t linger very long before moving on. Luckily it was just a light rain and no thunder or lightning was anywhere in the area. Looking out towards the Imp Cliffs from Middle Carter. Chris approaching the summit of Middle Carter. 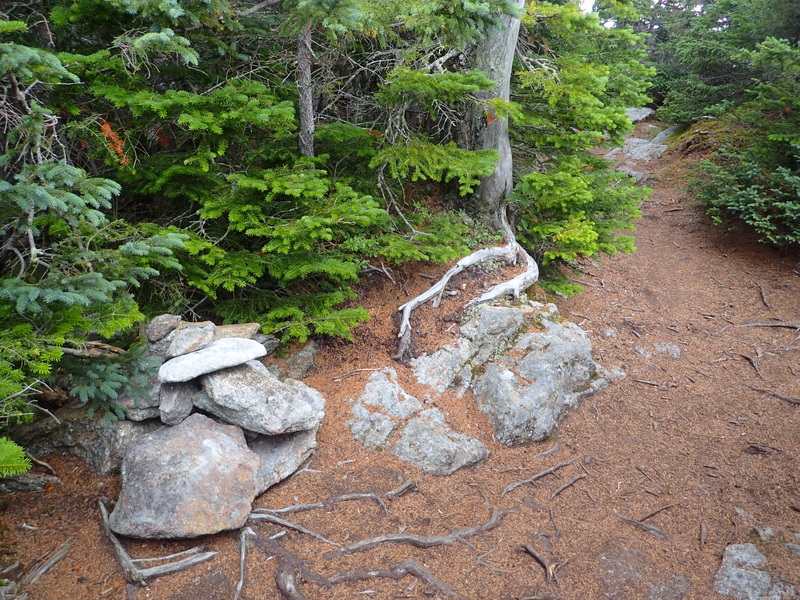 The trail opens up to a small clearing which you would think is the summit of Middle Carter but the true summit is actually further along the trail at a cairn in the woods. Normally we would have had great views from this clearing but unfortunately the rain cloud spoiled our views. 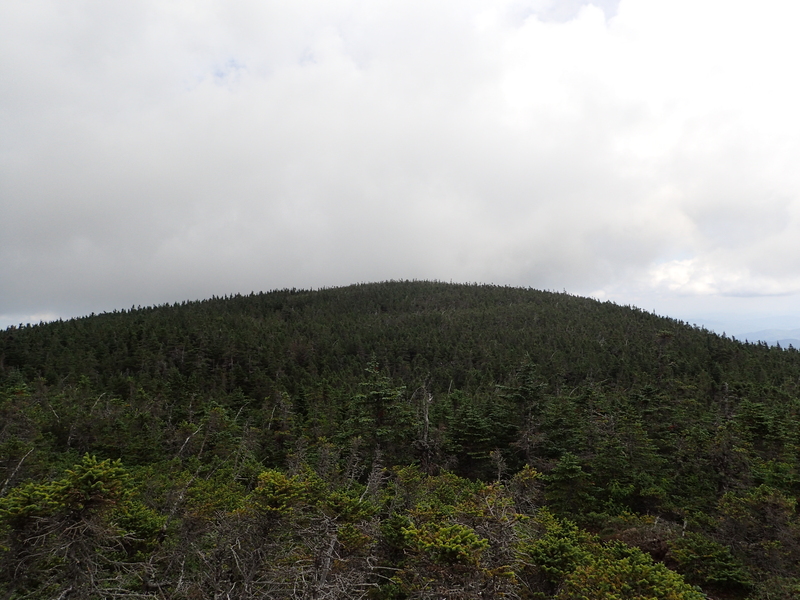 What I believe is the summit of Middle Carter. We moved pretty quick as the rain fell on us to try and get past the cloud and luckily it didn’t take to long before things began to shape up. View of the trail as we got rained on. Looking back at the cloud that ruined our views from South Carter. 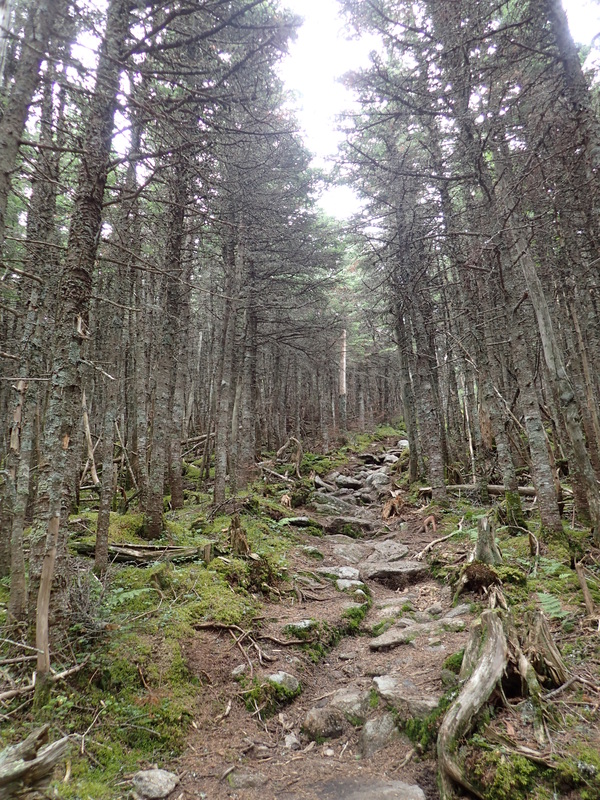 We continued our way down the trail towards South Carter which is also another wooded summit. 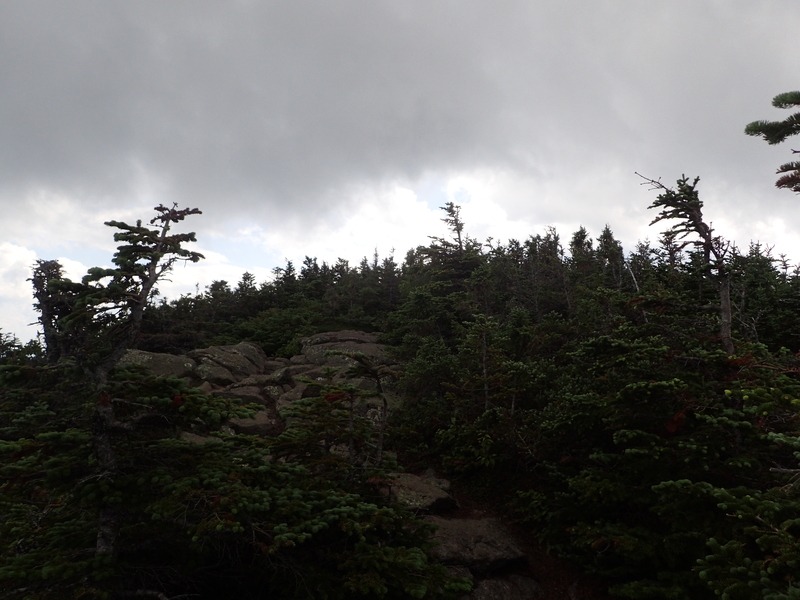 The weather began to improve as we made our way towards the summit which was refreashing. Wet trail as the rain began to taper off. Sunshine making everything better as we made some progress. 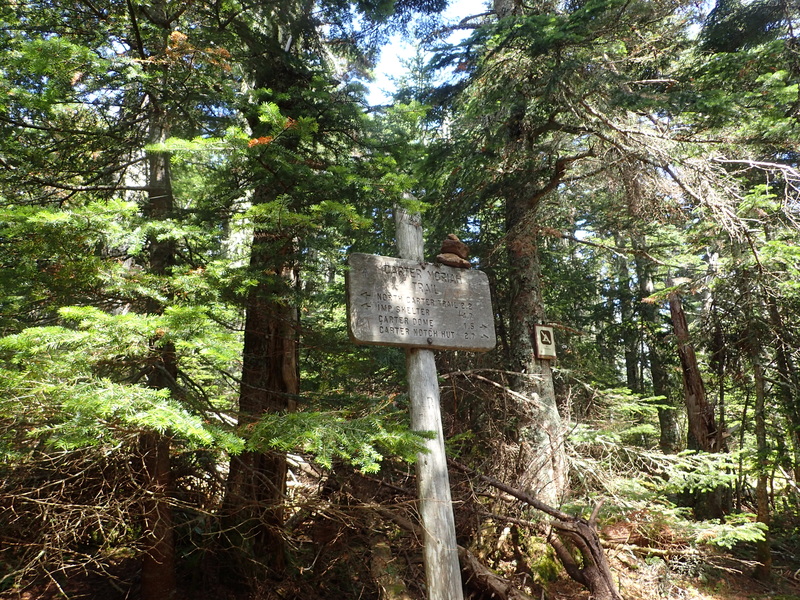 Since the summit is wooded there is nothing but a cairn marking the exact summit location. 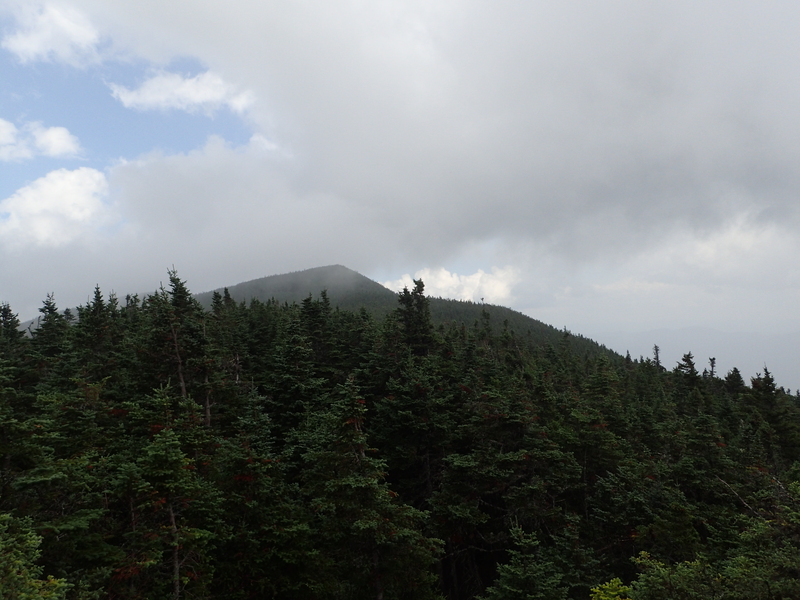 However we were able to find a viewpoint that offered at least some obscured views of the surrounding mountains. Obstructed view from near the summit of South Carter. Since there wasn’t much to see or much of a summit to speak of we didn’t linger too long before continuing our descent towards the Zeta Pass junction. The trail down South Carter was steeper than most of what we had encountered up to this point but it didn’t take us very long to navigate. 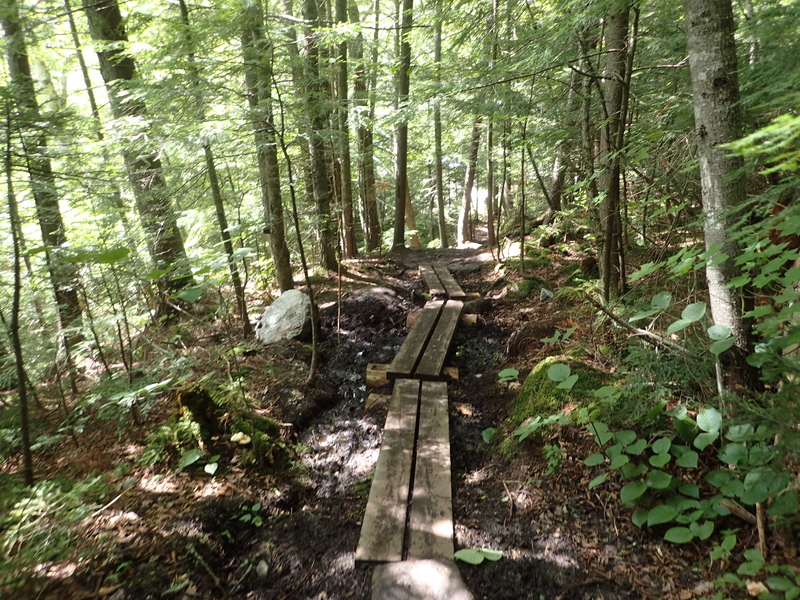 There were also more boarded walkways covering the muddiest sections of the trail. 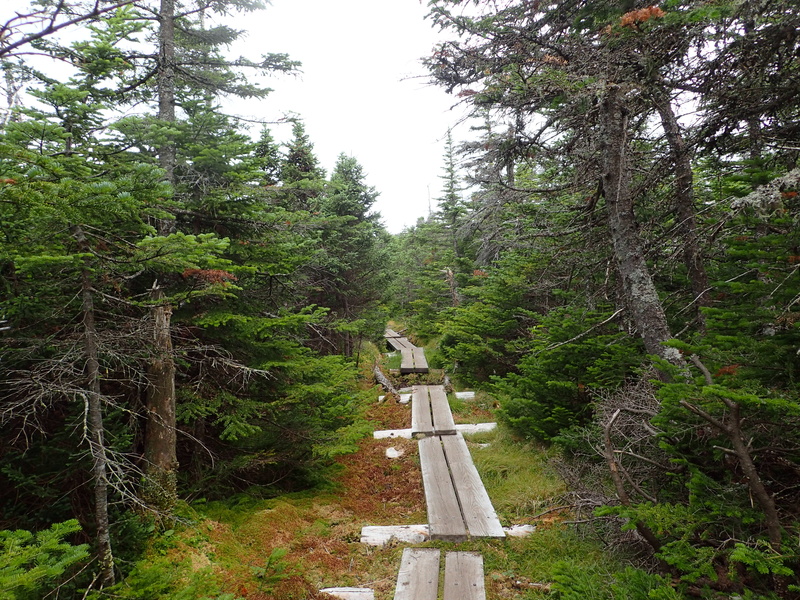 More boarded walkways along the trail. Before too long we reached the junction at Zeta pass. The junction was quite large and impossible to miss. 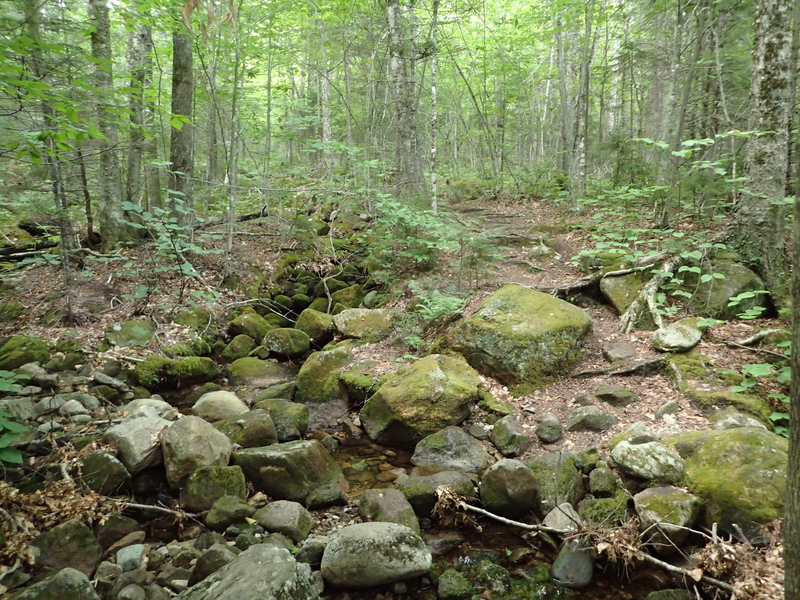 There were some hikers here complaining about not being able to find water at a brook that normally runs through this location but on this particular day was dry as a bone. Junction sign at Zeta Pass. 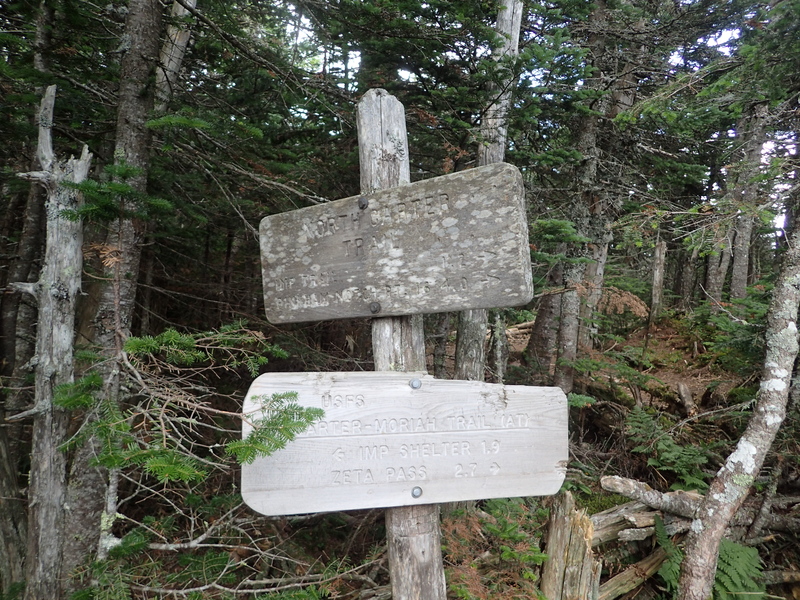 We made a right at the junction and continued down into Zeta Pass and on to the Nineteen Mile Brook Trail beyond. This was the route we decided to take to get back to Rt 16 and our car at the South Imp trailhead. 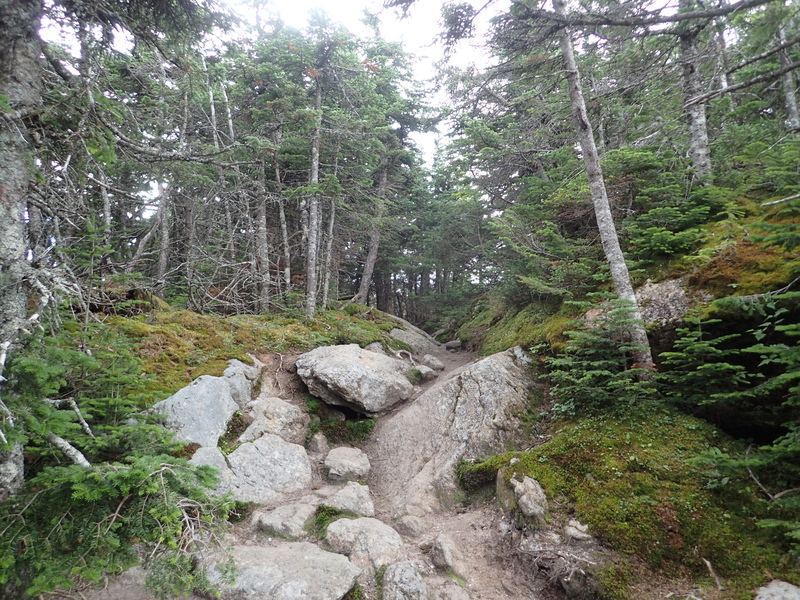 The trail itself was fairly steep but we made great time and didn’t stop very much on our way down. The trail follows the brook most of the way which made for a nice ambiance in the background. 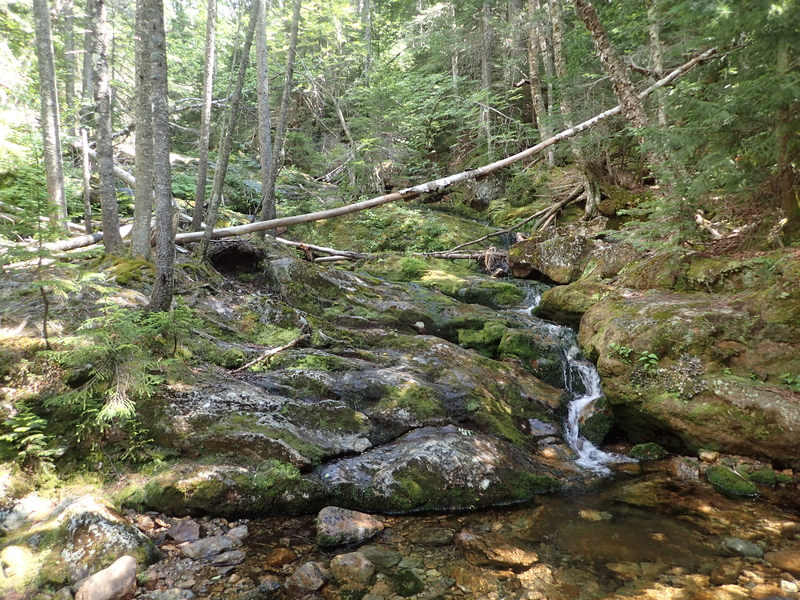 Before too long we were at the junction with the Nineteen Mile Brook Trail. From here it was just another 2 miles back to the road. 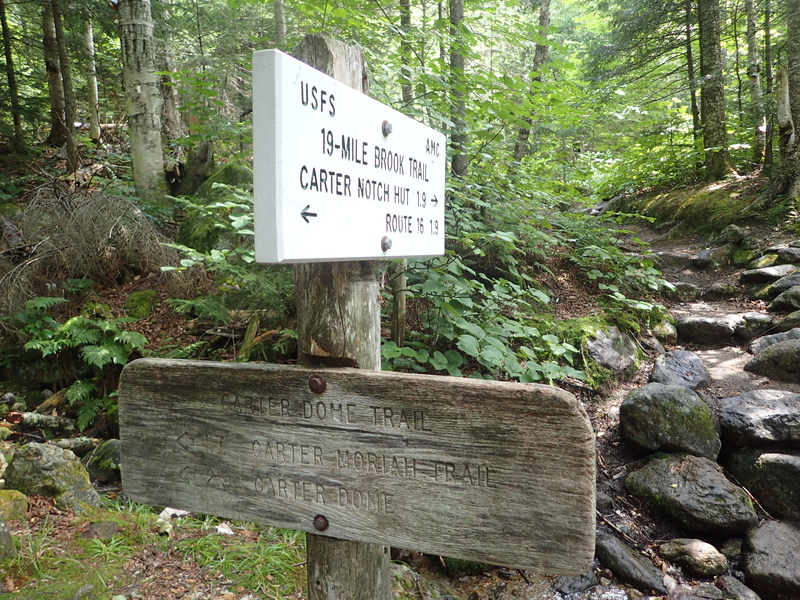 Last junction with the Nineteen Mile Brook trail. From here the trail got pretty muddy and wet but it was also very green which was a pretty big change from what we had seen throughout the day. 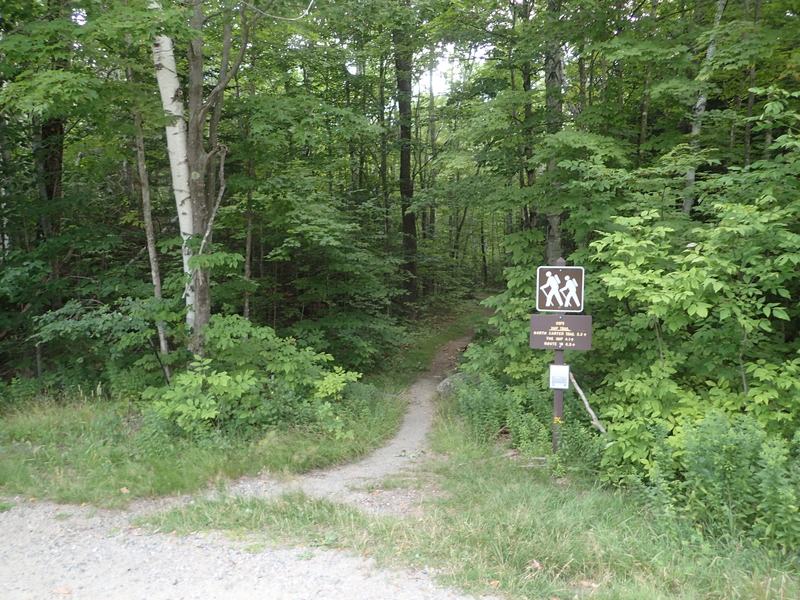 It was a beautiful trail overall with tons of viewpoints and places to stop along the way to enjoy the large brook which lends the trail its name. We didn’t stop to take many pictures along the trail but it would definitely be a great place to do that. 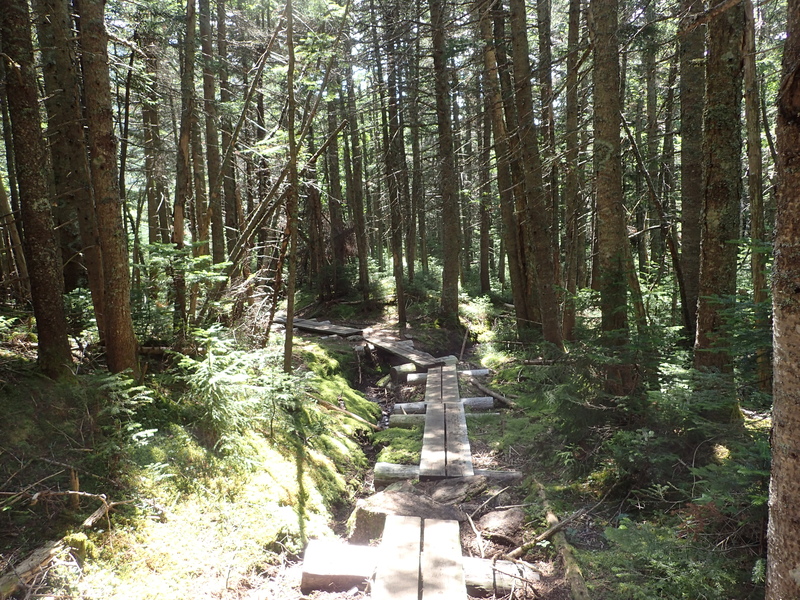 The trail was complete with boarded walkways and a very nice, newly renovated bridge in the worst parts. 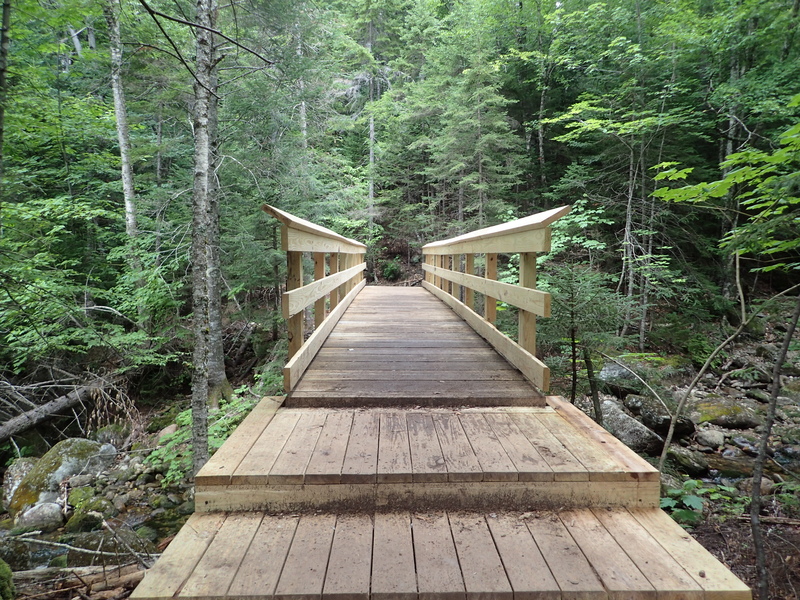 Newly renovated bridge along the trail. One of a few walkways along the trail. Long before we made it to the road we could actually hear the cars driving by so we knew we were getting close. 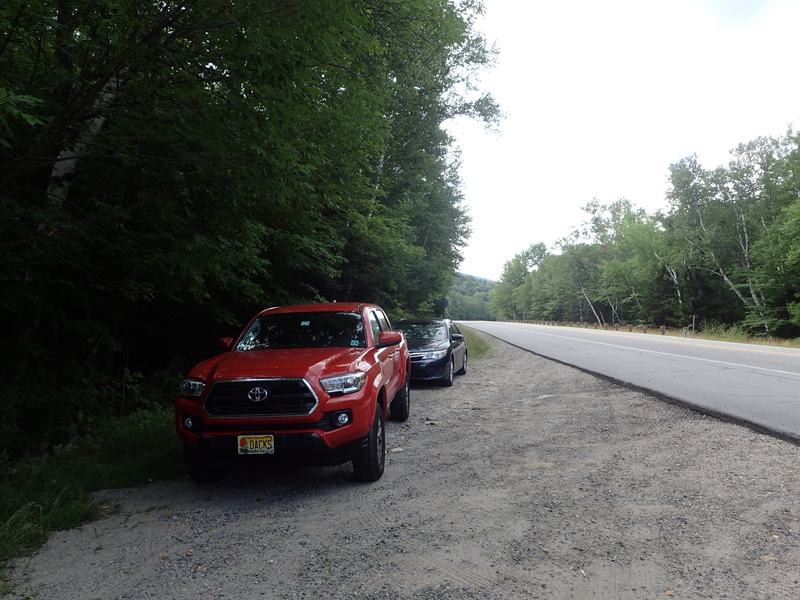 The remainder of the hike passed without incident and we finally emerged from the woods at the parking lot for the Nineteen Mile Brook Trailhead. From here we hung a right and walked the last 2 miles or so back to the car. All in all it was a fun day out in the mountains. We were able to stop and collect the samples I needed for my research as well as bag a couple of peaks for my list. I look forward to making it back soon to bag a few more peaks and hopefully get some better views along the way!